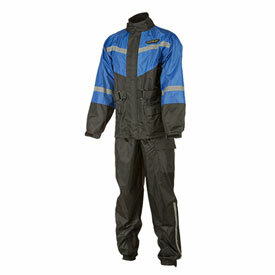 High quality polyester shell construction with slick inner liner makes putting the suit on a breeze. High waist to keep water from entering under coat. Removable shoe straps hold the pants down to keep water from blowing up your leg. Rear vents help remove hot air to keep you drier. Reflective back logo and reflective stripes on chest, back and arms help visibility. Fits good and keeps the rain out. Does all I ask, only worn it once so I can't attest to the durability. My wife and I rode in pouring rain in traffic for 45 minutes and didn't get wet at all!